Our HSEQ policies are our commitment with a primary objective to ensure the wellbeing of our employees, sub-contractors, customers, company property and to maintain a safe pollution free operating practices that complies with international regulations, standards and guidelines. AMASCO recognizes that it can achieve its vision if company activities are managed through a Quality Management System. The management and employees are committed to provide good value quality services that fully confirm to customers contractual and regulatory requirements. The management and staff are aware of the vital role of quality in achievement of the company’s objective and targets, building the customer satisfaction and confidence in products and services provided by AMASCO. 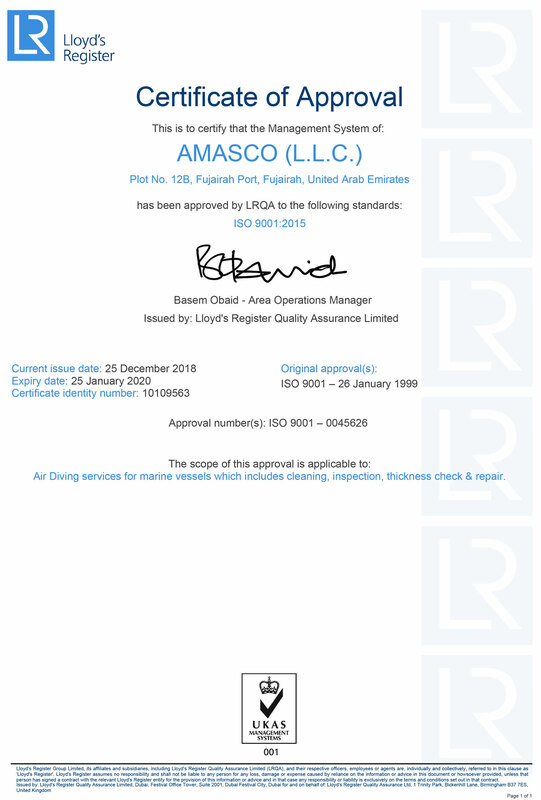 It is AMASCO’s policy to establish, maintain and continually improve an effective and efficient Quality Management System that comply with ISO 9001:2015 standard requirements which cover all operations of the company and applies to all its personnel. In order to achieve the above, the following will serve as our corporate goals. The overall goals of AMASCO are to meet the requirements and surpass the expectations of our customers. To earn and maintain the confidence of our Customers through providing a Quality Service. By continuously improving the performance of the quality management system through the use of the Quality Policy, Quality Objective, Audit Results, Analysis of Data, Corrective and Preventive Actions and Management Reviews. AMACO puts the safety and health of its employees, subcontractors, clients and communities where it does business as its first priority. If a job cannot be performed safely, it will not be performed. We respect a ‘safety first’ attitude by and for our fellow colleagues. Good safety standards will be strictly selected and incorporated to a systematic approach to the way we work. Continuous feedback will be encouraged to improve our safety standards. We will not accept shortcuts which circumvent safety. Safety is a first consideration when we make decisions. Our leaders will demonstrate a day-to-day commitment to safety. We will ‘stop and act’ to correct situations that could harm ourselves or others. We encourage an inquisitive attitude and behavior towards challenging assumptions and considering potential adverse safety and health consequences of planned actions. Our safety systems will be applied effectively to ensure all hazards are identified and addressed before work begins. We will embrace organizational learning to improve the way we do things, and we will openly examine our operations and solicit feedback from external resources. AMASCO workers are expected to protect themselves and others against accidents. All accidents and incidents are preventable. An accident-free workplace is achieved through careful planning, close attention to hazard controls, worker involvement in task planning, and halting work in the face of uncertainty. AMASCO management will continue to promote safety throughout the work environment. We will all take pride in doing our work to a high standard of safety and wellbeing of those who work with us or are impacted by the work we do.